The Fab Foundation today announced the opening of a Digital Fabrication Laboratory (Fab Lab) at California State University Bakersfield’s [CSUB] School of Natural Science, Mathematics and Engineering. The Fab Lab, made possible by a generous grant from Chevron, offers hands-on, project-based learning opportunities to the community, with particular emphasis on STEM education for students in grades K – 12. Like the more than 400 facilities in the Fab Lab Network, the CSUB Fab Lab, is centered around a suite of digital fabrication tools and prototyping machines such as laser cutters, 3D Printers, and milling machines, used for “Making (almost) Anything”. 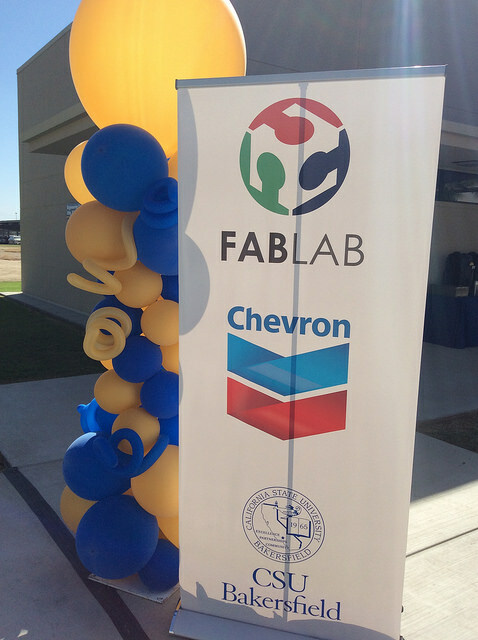 It is the first of ten Fab Labs that Chevron is bringing to areas where the company operates as a result of the energy company’s strong commitment to communities and STEM education in particular.